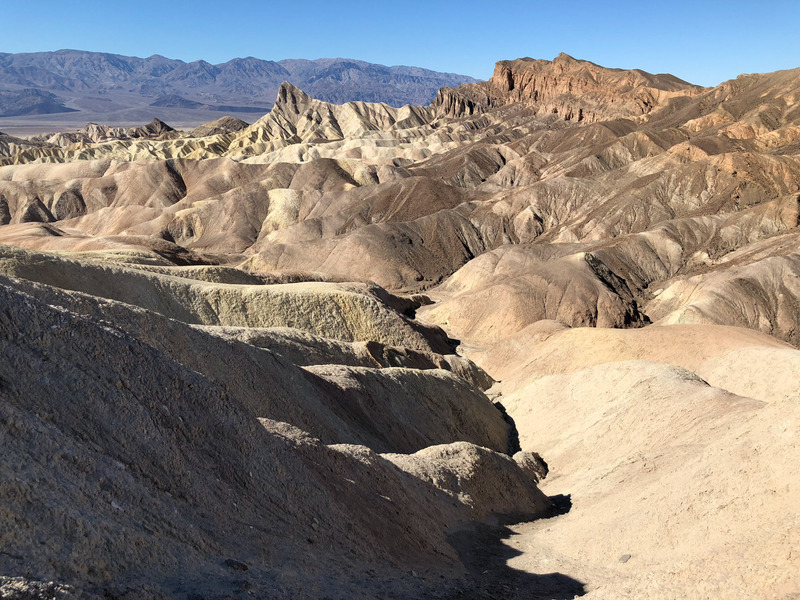 Our final destination on this trip was Death Valley. I had no idea what to expect. I’d driven through a portion of the valley a decade ago but didn’t remember how mountainous it actually is. Temps during our stay were in the high 70s at day and low 50s at night. It was perfect. 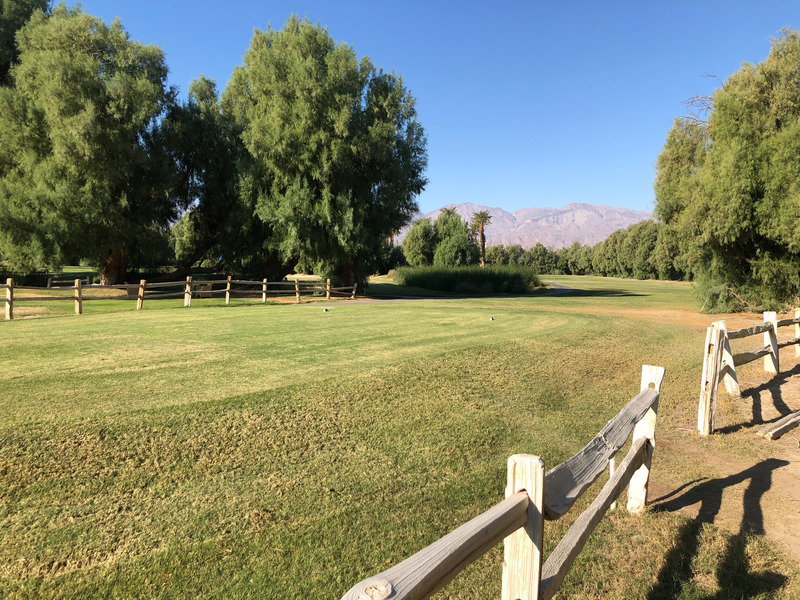 The first night we stayed at Furnace Creek Campground located next to the Death Valley Visitor Center and the Oasis at Death Valley (formerly known as Furnace Creek Resort). 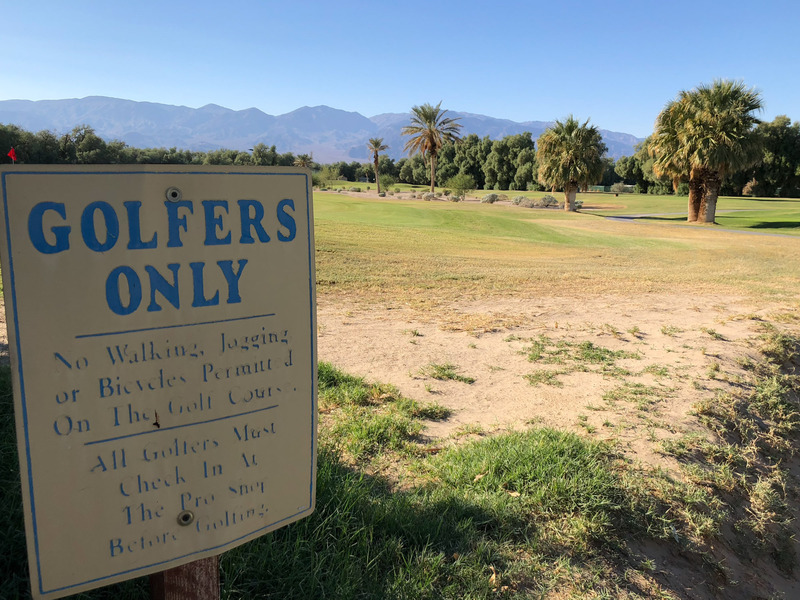 There’s an expensive inn, an economy hotel and a few private RV campgrounds in the area including Fiddler’s Campground that had live music (karaoke and sometimes yodeling) after dark that could be heard from our campsite a block away. 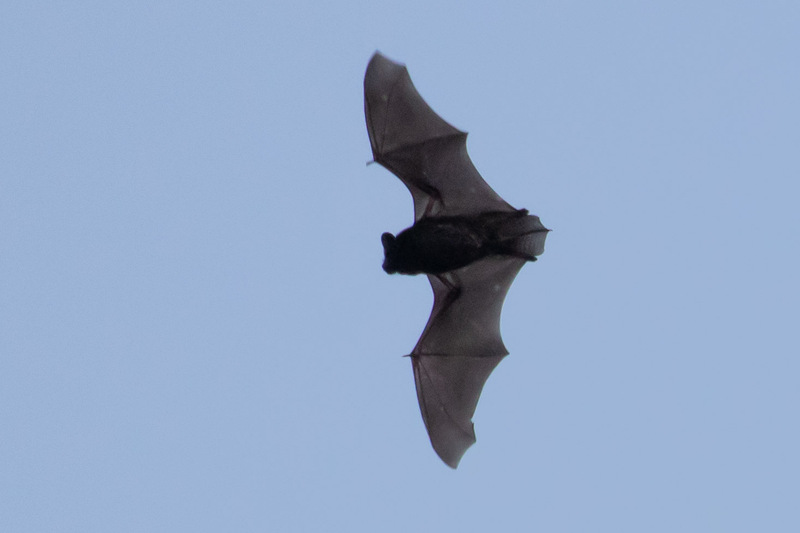 Bats made up for the lack of ambiance. I knew camping here would be a challenge but this lush green “oasis” is where many birds drop down during migration. 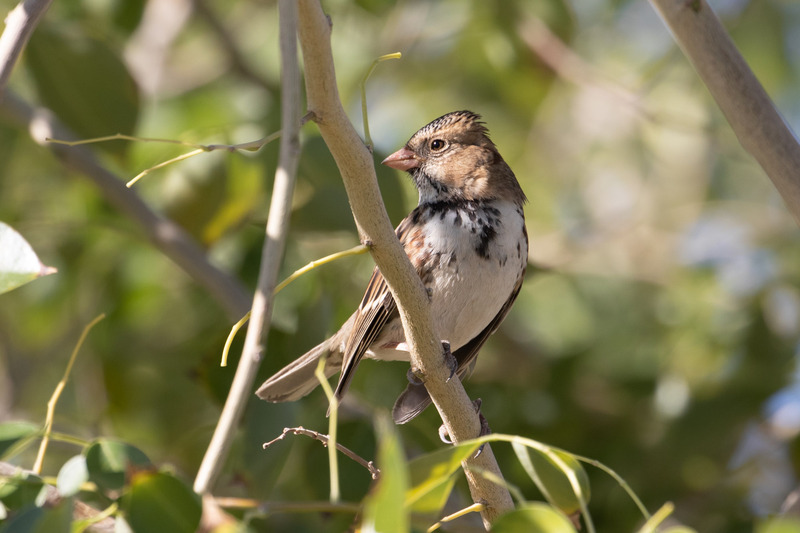 Amid festivals, a parade, construction, general business and a constant stream of cars and people around me I made the most of it and birded like I do. Luckily the birds didn’t seem to mind the chaos. 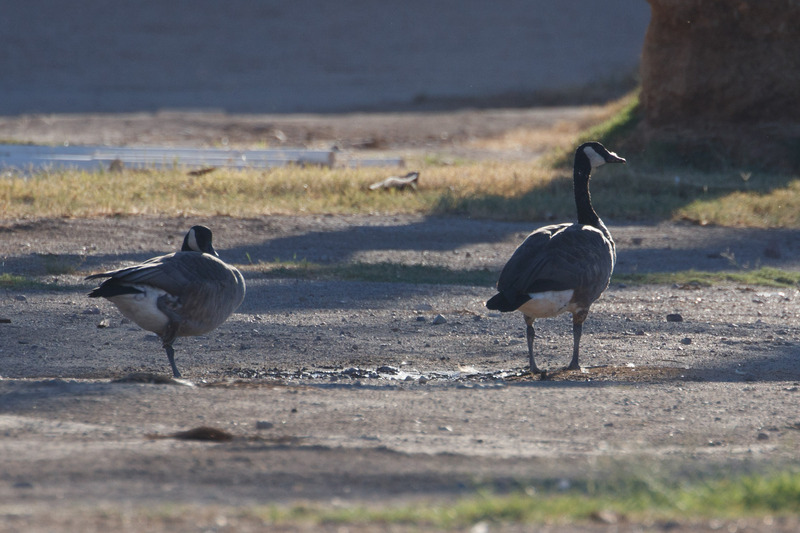 The first evening I found a pair of Canada Geese on the golf course, because of course they would be there even in the desert. 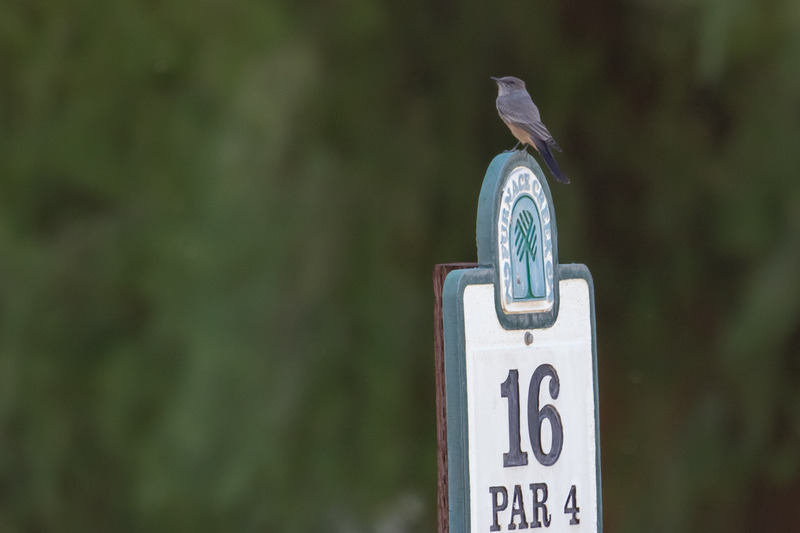 Per the Birder’s Guide to SoCal the golf course is private property and birders are not welcome while others “commit golf.” So I followed the rules and birded from the fringes. Though some were less obedient. From aerial photos (and per some eBird reports) I could see ponds on the property, but I couldn’t find a way to access them without trespassing. I got pretty close but ran into a dead end of thorny shrubs and had to backtrack a couple of miles. Not my finest hour. 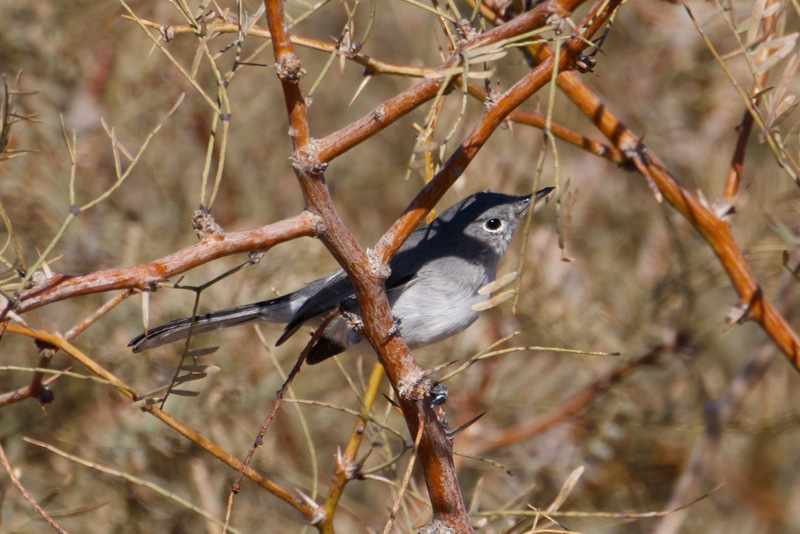 But I did find a Blue-gray Gnatcatcher (not black-tailed since it has more white under the tail). I ran out of time (energy and water) to find another way in. 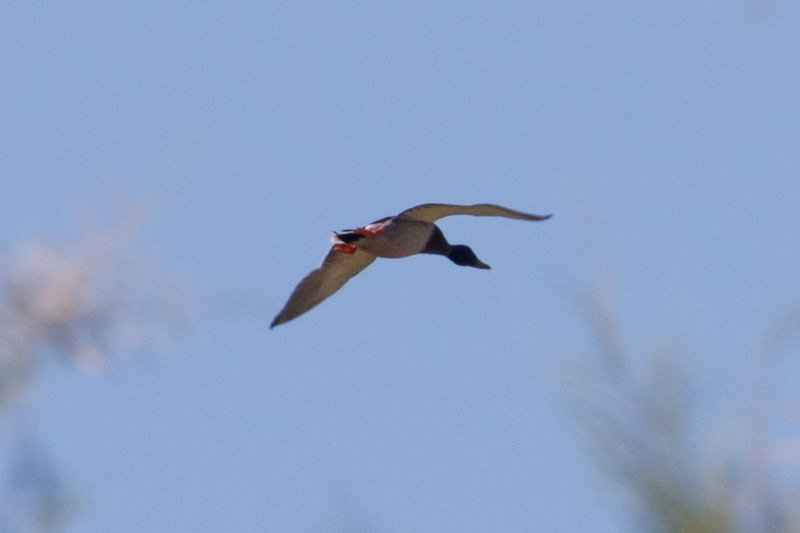 The best waterbird besides the geese was a flyover Mallard. 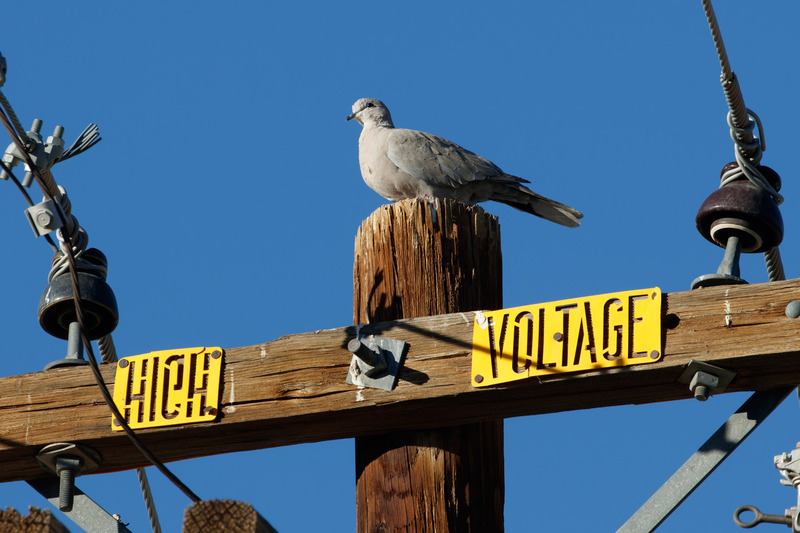 The book mentions to look for White-winged doves calling from the Tamarisks or, “lately, Eurasian Collared Doves.” I could only find Eurasian-collared Doves and there are sparse eBird reports of White-winged on the property in recent years and none from 2018. 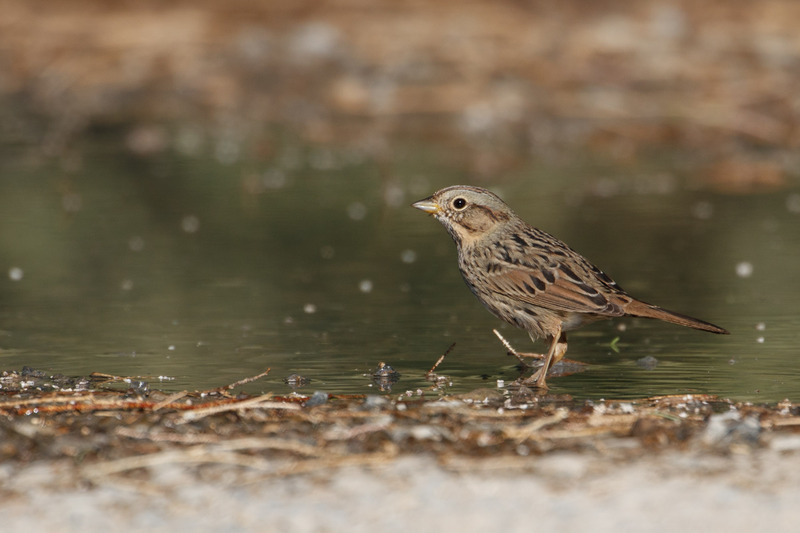 The grounds had a few good sparrow spots. 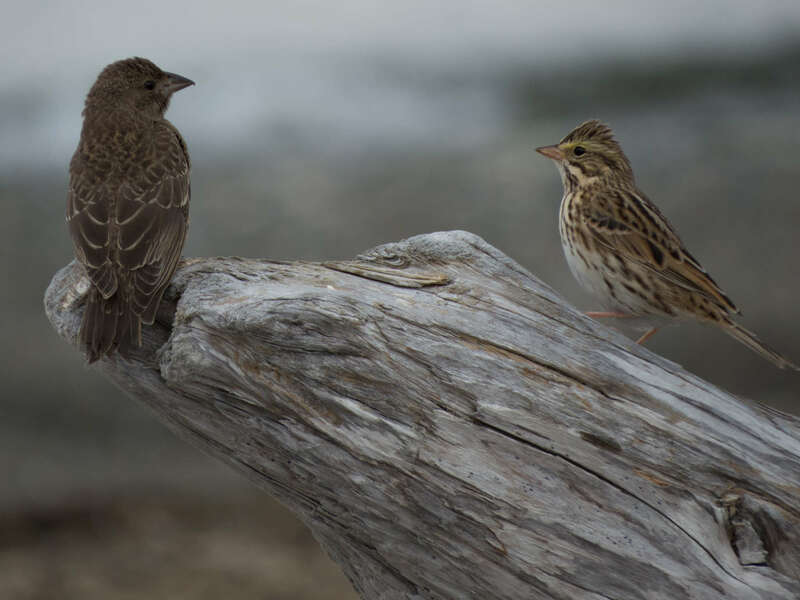 I found House, Savannah, Golden-crowned, White-crowned, weird looking Song Sparrows. 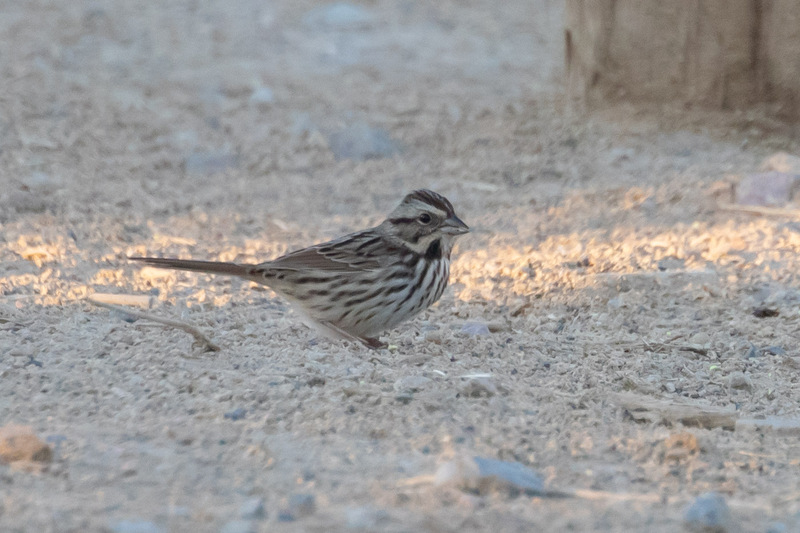 And lots of Lincoln Sparrows. 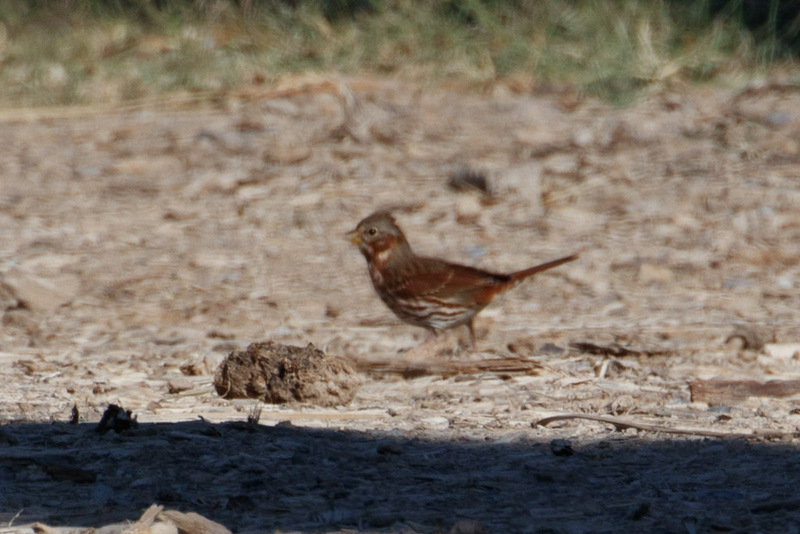 One lucky afternoon I picked out a (Red) Fox Sparrow in the heat waves. 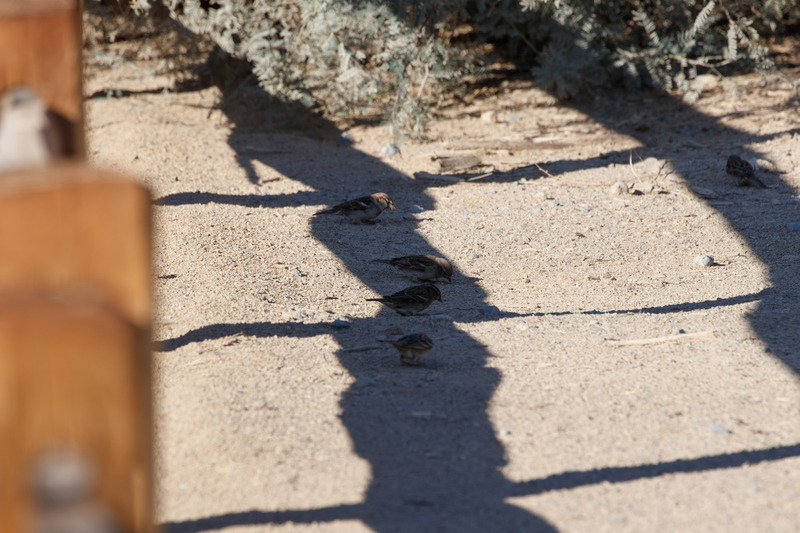 It was interesting to see birds’ strategies for keeping cool. Most stayed in the shade. Some panted, or splashed in puddles or took dust baths. 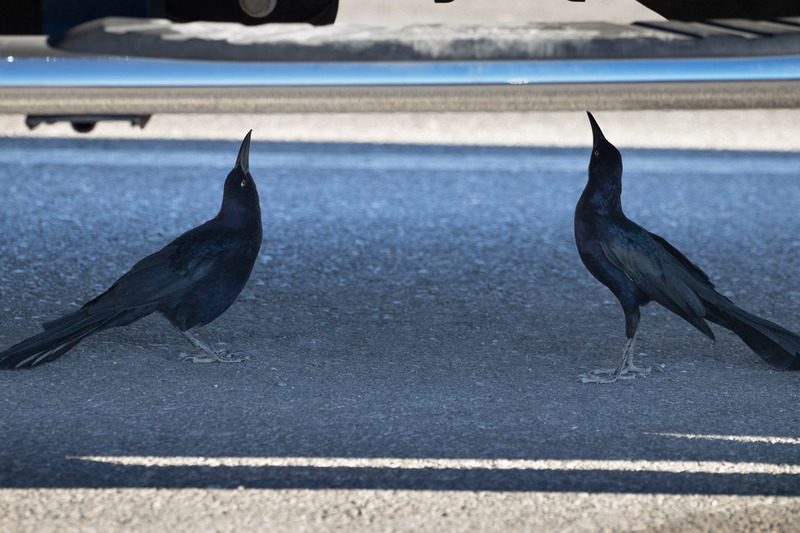 I saw some blackbirds drinking from sprinklers at the visitor center and I found a pair of Great-tailed Grackles taking shade under cars in the parking lot. 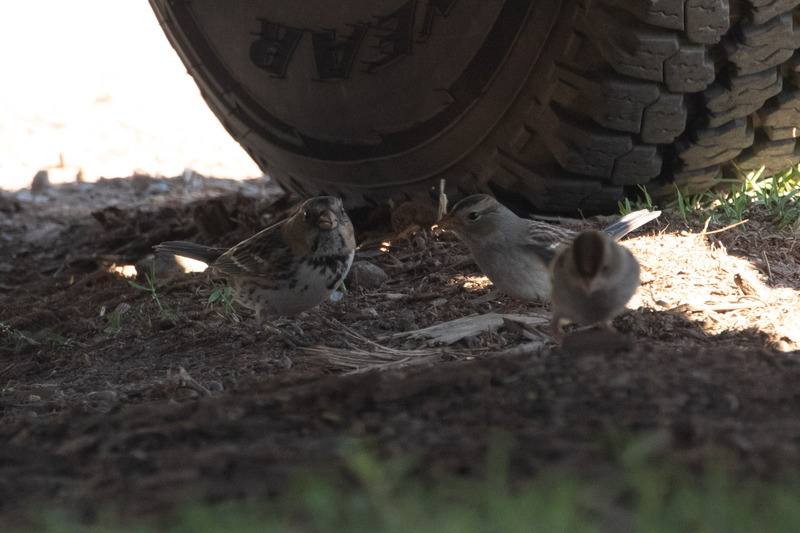 The best parking lot bird was a Harris’s Sparrow! 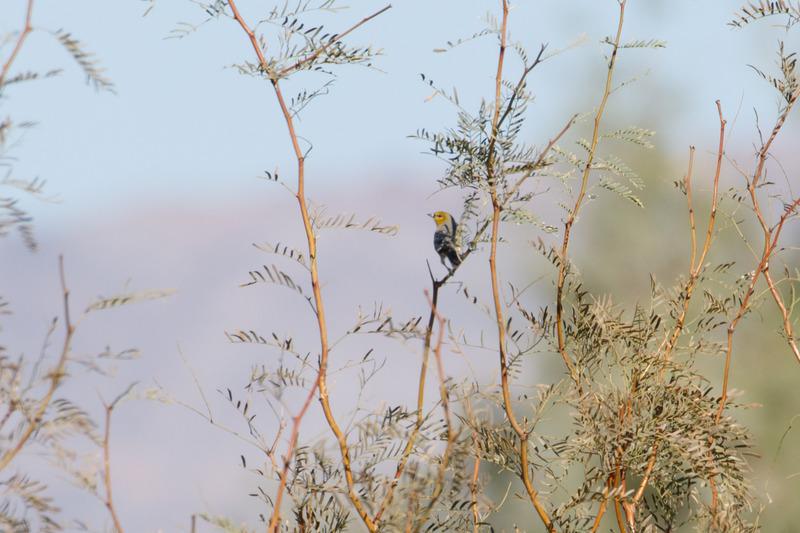 A rare bird for the area. I “pished” for a brief moment and it immediately popped out on a close shrub. Amazing! 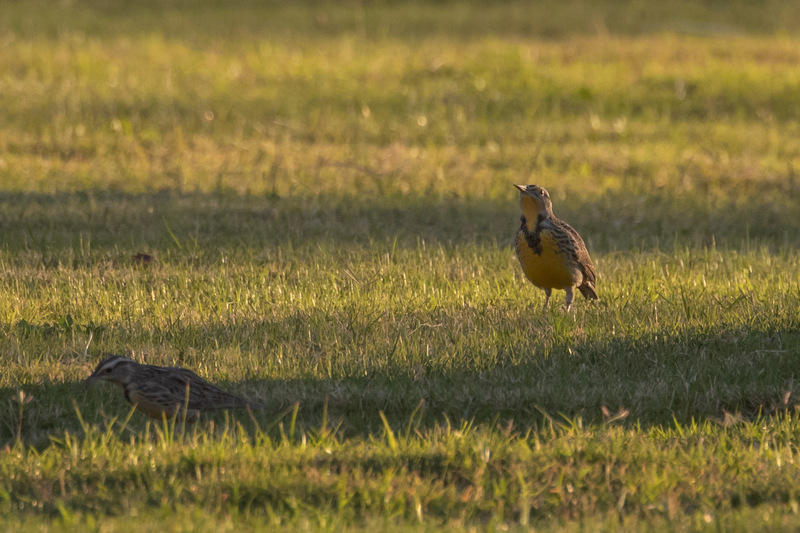 I found a variety of Icterids too, including Brewer’s Blackbird, Red-winged Blackbird, Brown-headed Cowbird, and the best surprise was Western Meadowlark. 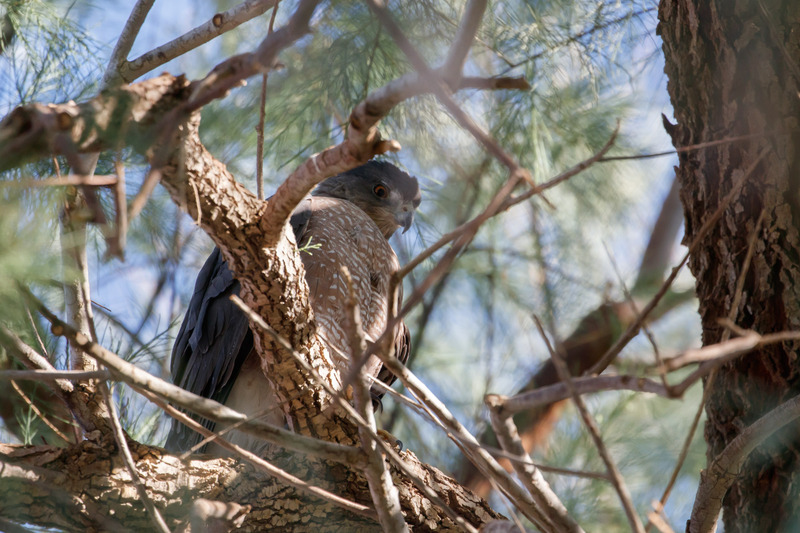 In the shade of trees above there was a Cooper’s Hawk. 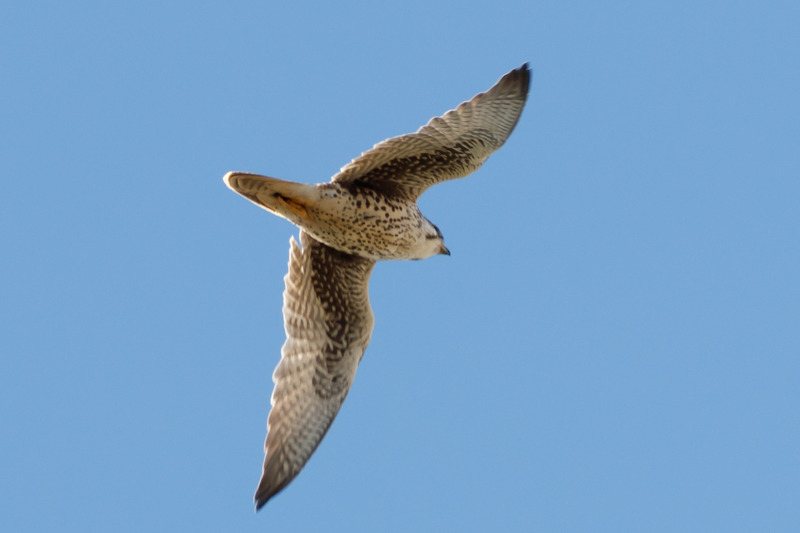 I had a couple of falcon fly-bys a Peregrine and a Prairie. We had perfect weather until almost the last day when a windstorm blew through the valley. 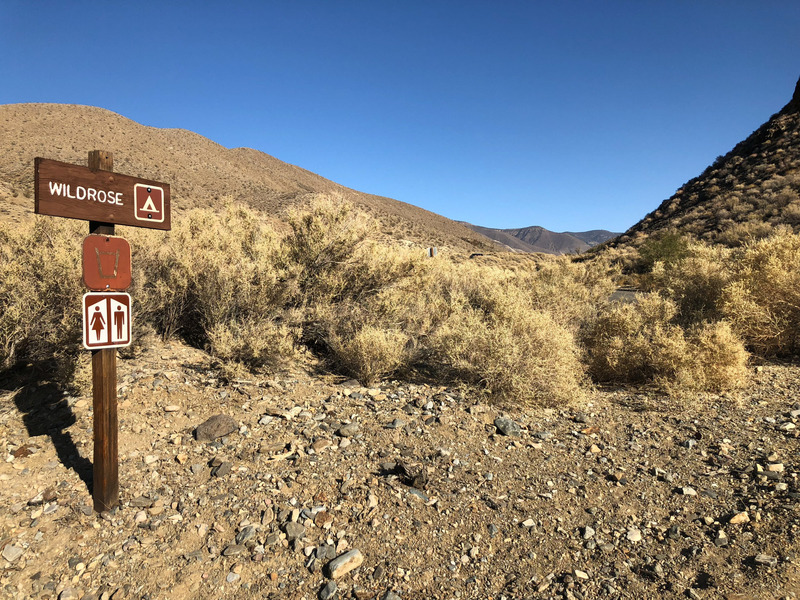 It wouldn’t be Death Valley if it didn’t try to kill us. 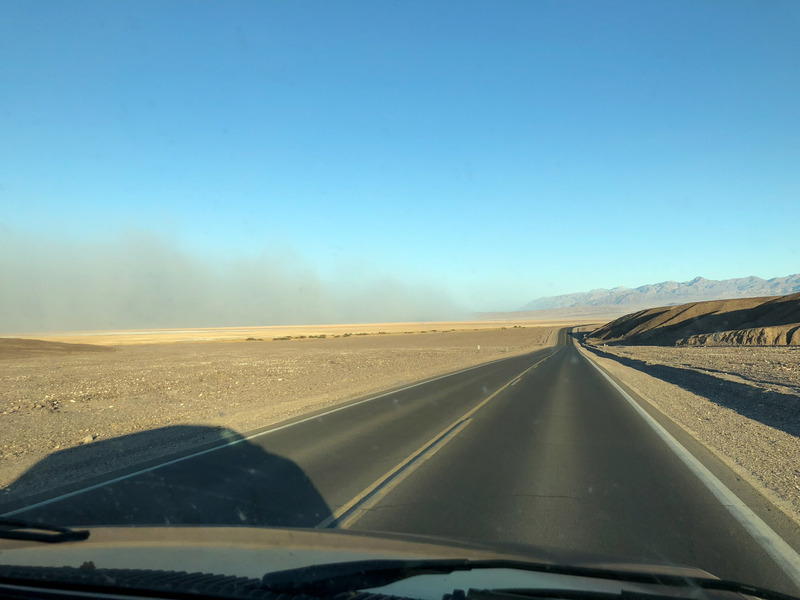 The windstorm then turned into a sandstorm. Terrible for birding or doing anything outside. Luckily we had the van for shelter, and this was also the day we drove to a smaller campground at higher elevation called Wildrose. It was less sandy here, but still very windy. 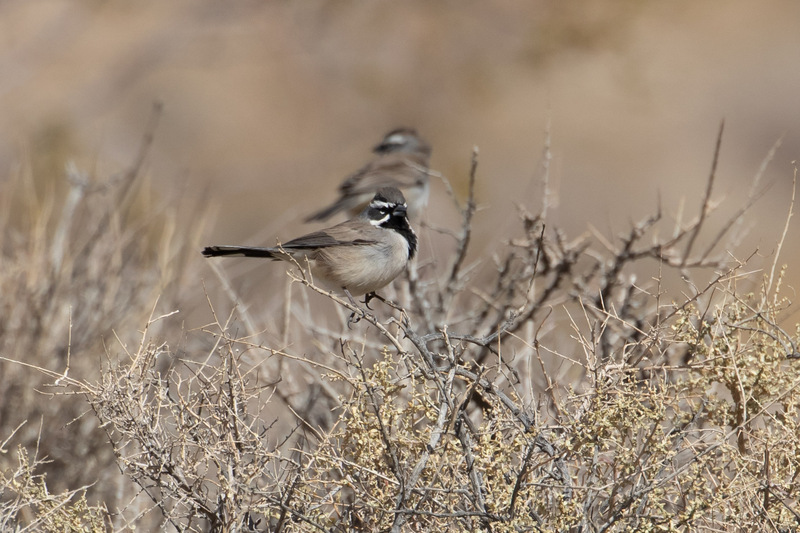 From the safety of the van I spotted Black-throated Sparrows on the hillsides. We drove a little ways past the campground towards the charcoal kilns but the road conditions turned too bumpy so we turned around. 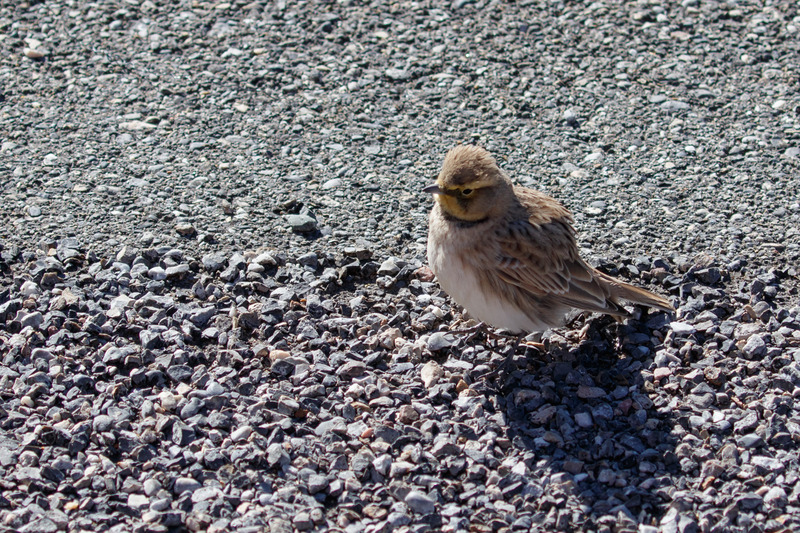 On the way back we pulled over for a Horned Lark that hopped right up next to the van. 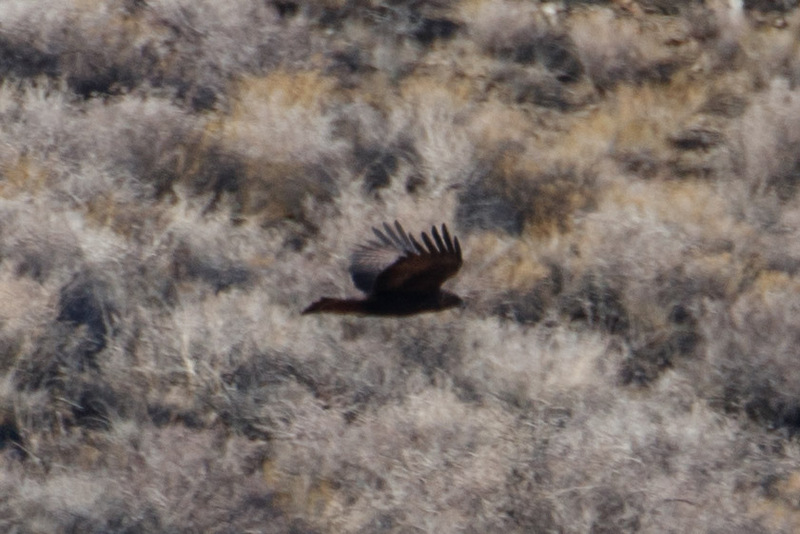 And we had distant looks at a Golden Eagle! 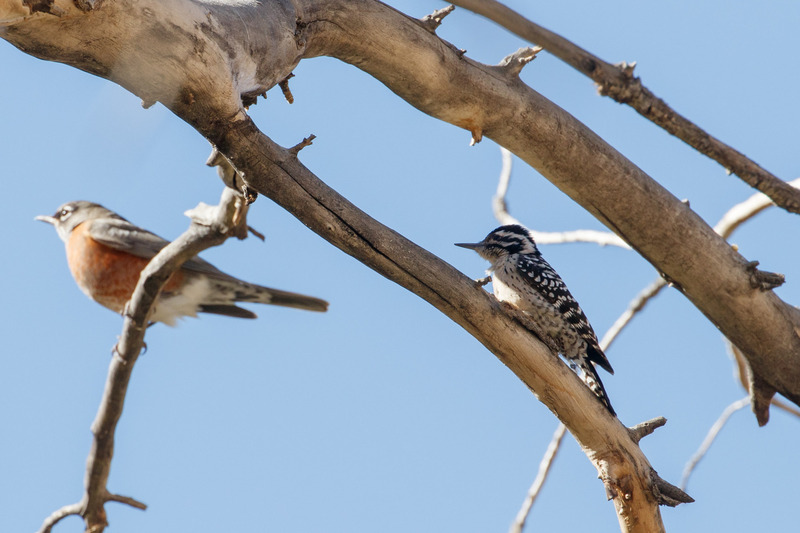 Back at the campsite I walked the road down to a small creek and found a Ladder-backed Woodpecker. 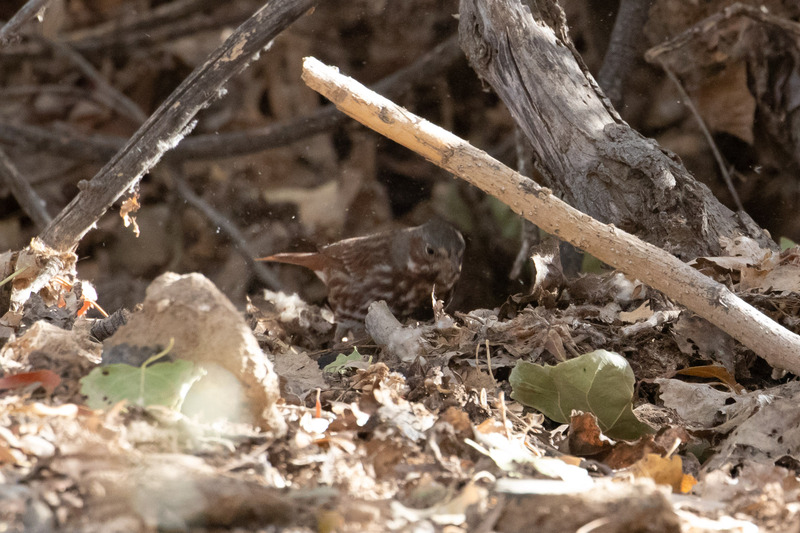 And a Fox Sparrow scratching in the leaves. 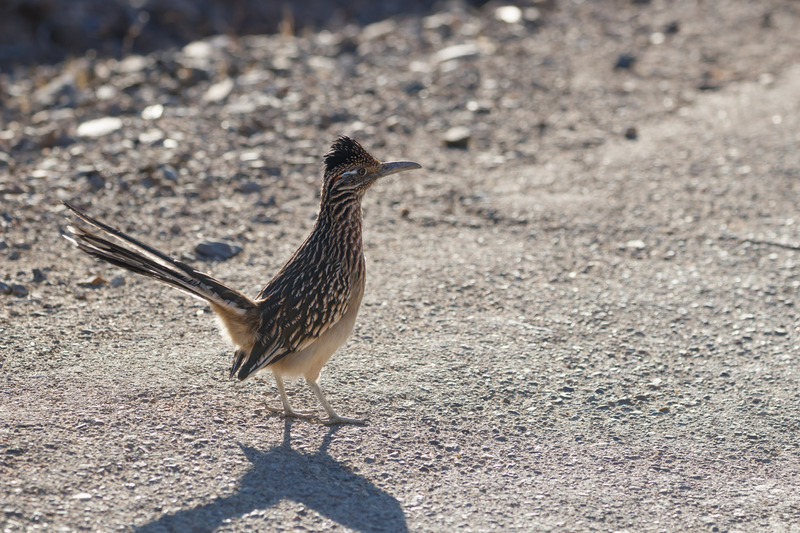 As the sun was setting (at 4pm) and as I walked back to the campground I felt good about how birdy Death Valley was but I was also a little sad I hadn’t seen the poster-bird, a Greater Roadrunner, when just at that moment one walked right out in front of me. It raised its tail up and slowly lowered it down then continued down the road. It was the perfect ending. I have to say, writing about our trip I can’t help but think about the recent fires in California. It’s heartbreaking news. I’ve made a donation to the San Francisco SPCA for their disaster relief efforts to save animals affected by the fires. Much love to everyone in the state, they’ve been through a lot. 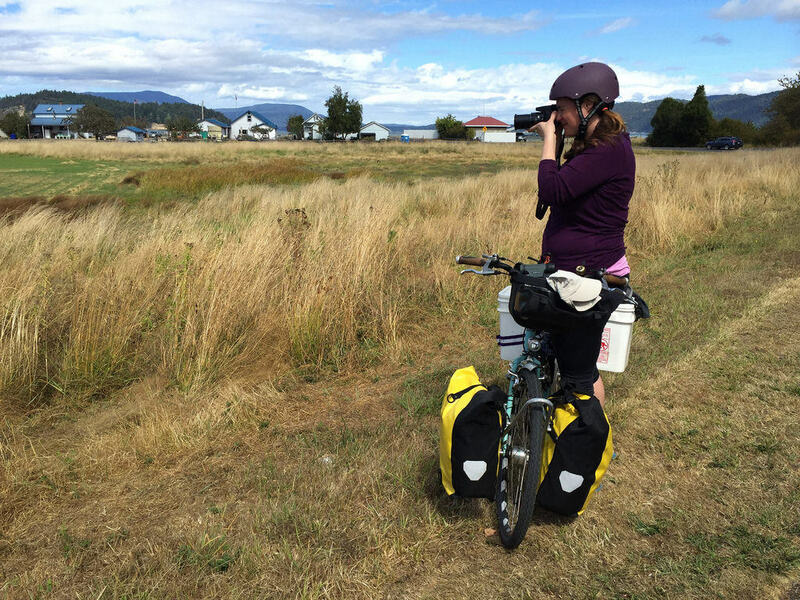 This summer I finally conquered a trip that had been on my bucket list for a decade: Bike Touring San Juan Islands. Sounds exotic, right? It was actually way easier and more familiar than I thought it would be. Though traveling by ferry was different, the ferry schedule was easy to follow. Like a bus on water, the trips between islands are short (about an hour), on schedule, and free after the first ticket purchase (a very reasonable $13.25/person + $2/bike). 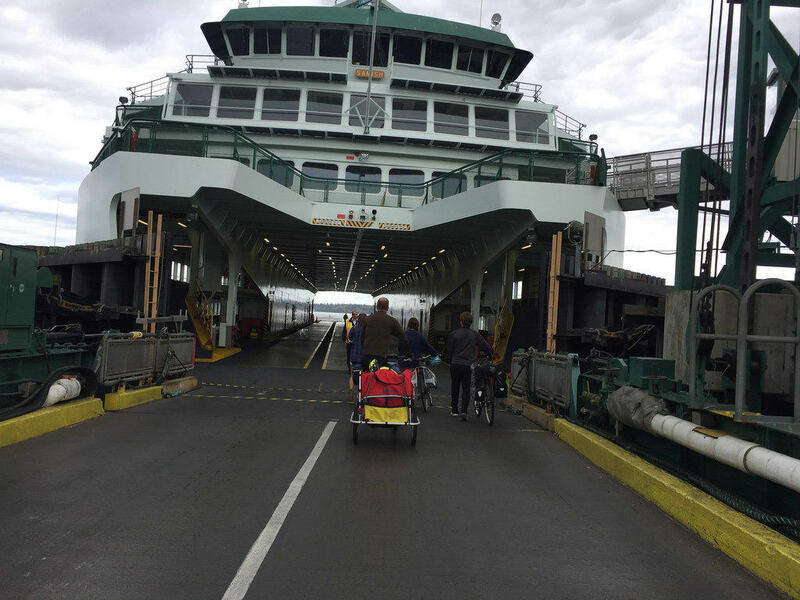 The most difficult part was awkwardly tying the loaded bikes in the slanted and sometimes crowded cargo area. Tomas and I planned two nights on each island Lopez, San Juan, Orcas, and Shaw. Lopez starts steep, but then levels out into one of the most bike-friendly of islands. 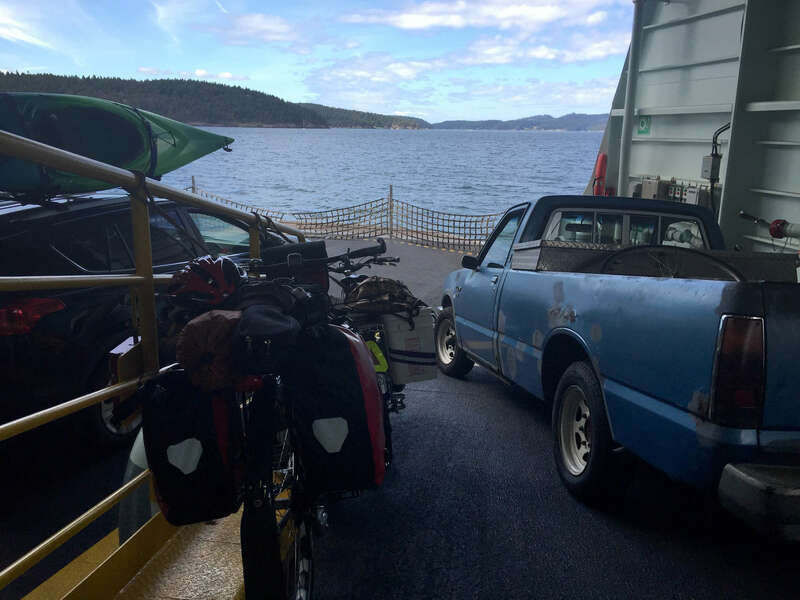 Spencer Spit State Park with excellent bike-camping sites is only 4.5 miles from the ferry dock. And Lopez Village, full of supplies, beer, and ice-cream is 3 miles west of the park. 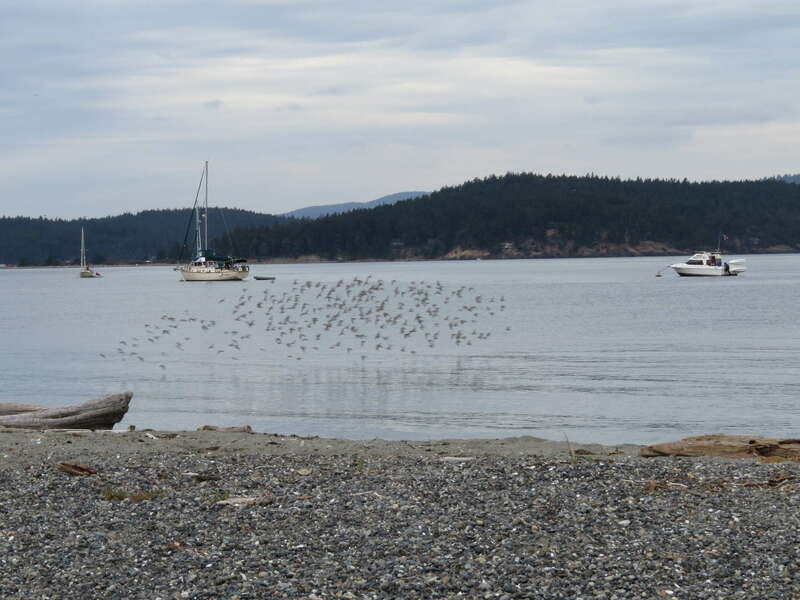 Spencer Spit also has one of the best public beaches on the islands. 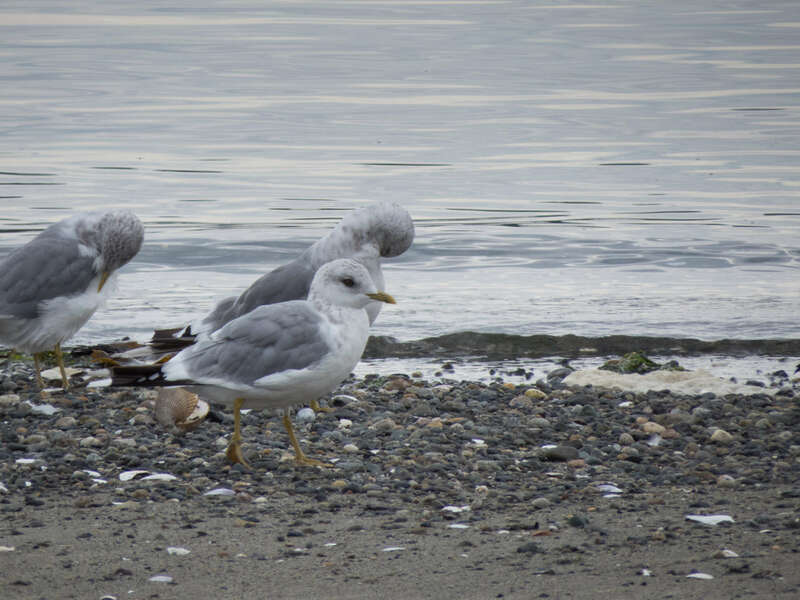 And beaches bring birds. 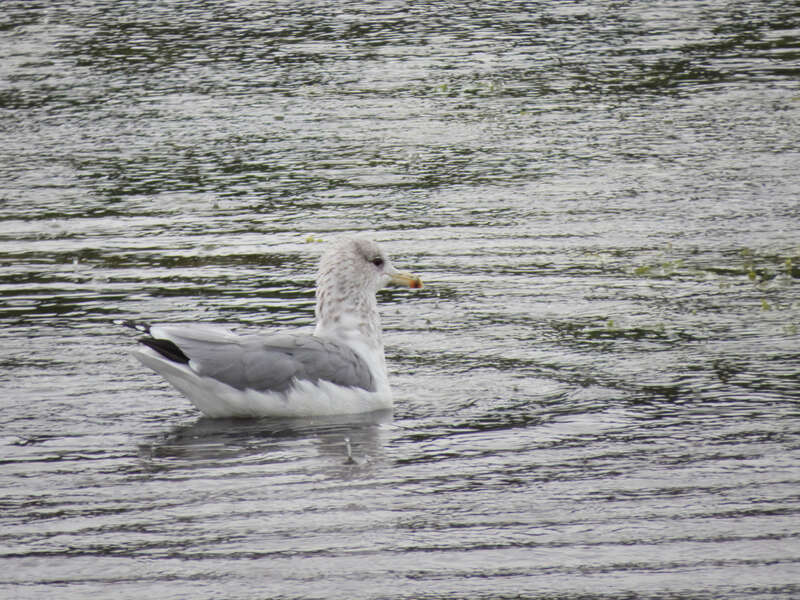 Gulls of course. But there were a couple of small surprises. 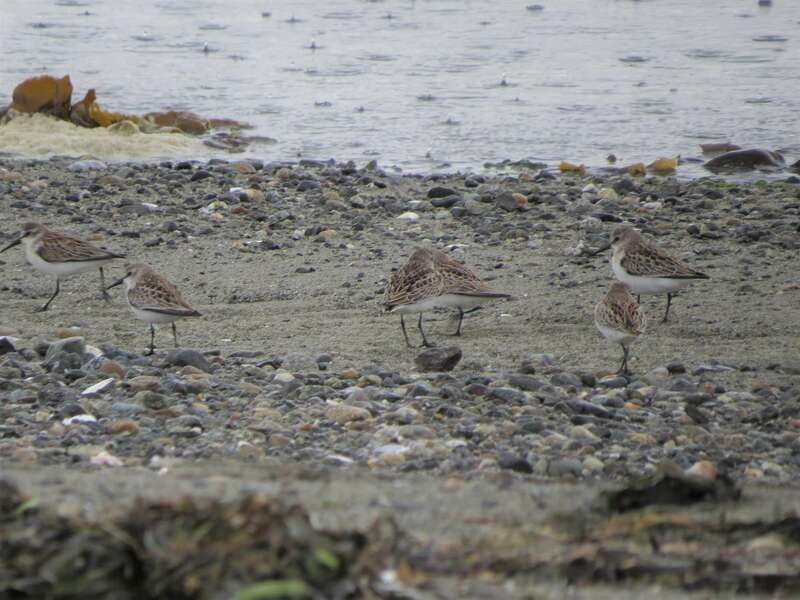 Like Least Sandpipers. 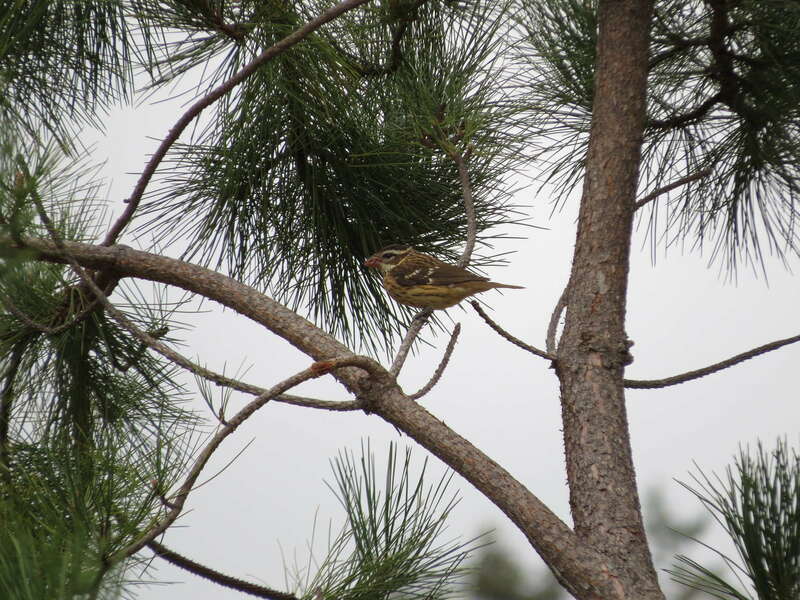 They have greenish-yellow legs (poor light in this photo), and small slightly drooping bills. 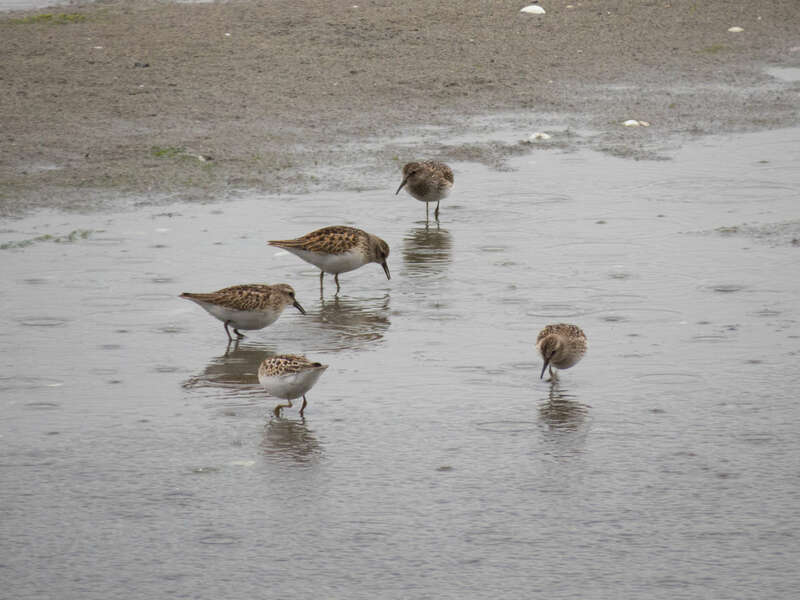 And they are usually seen in smaller numbers as compared to other peeps, like Western Sandpipers. Which were also present in larger flock style. They settled briefly and I could see the differences from the least. 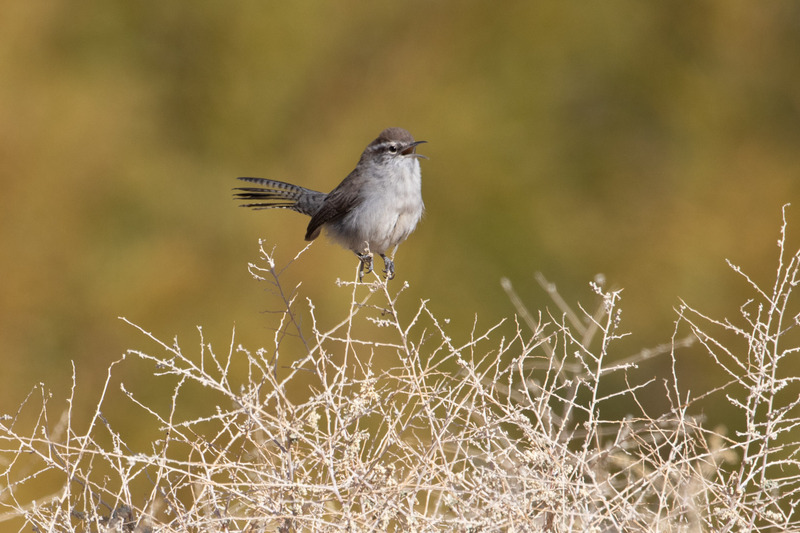 Westerns have black legs and a somewhat stouter slightly longer drooping bill. Practicing peeps. I need to remember to look at the legs. About this point it started raining. 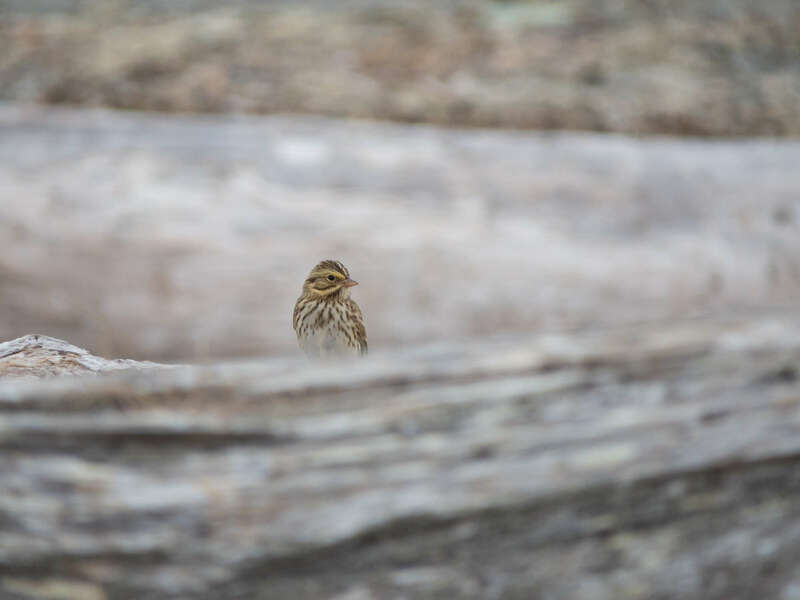 But before it started pouring I saw a pretty little Savannah Sparrow in the driftwood. 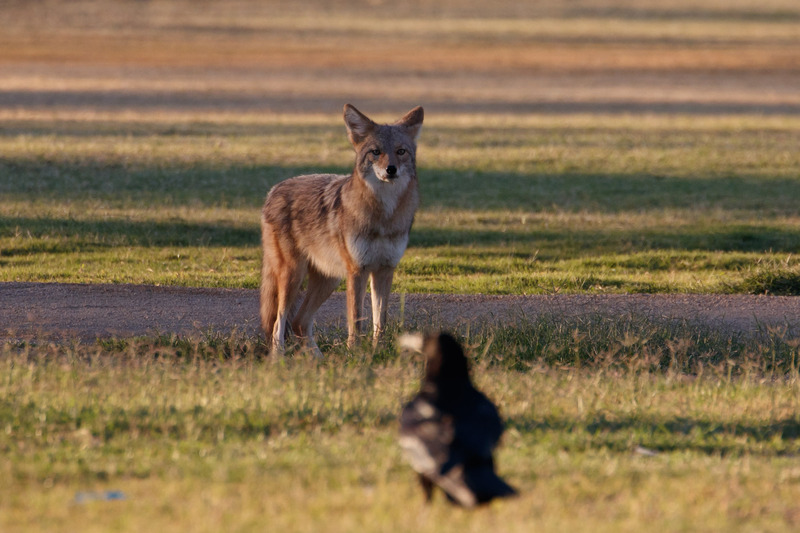 And its giant adopted relative, Brown-headed Cowbird. Then it poured and I saw two Caspian Terns, but I didn’t stay long to watch them before running for cover from the rain. 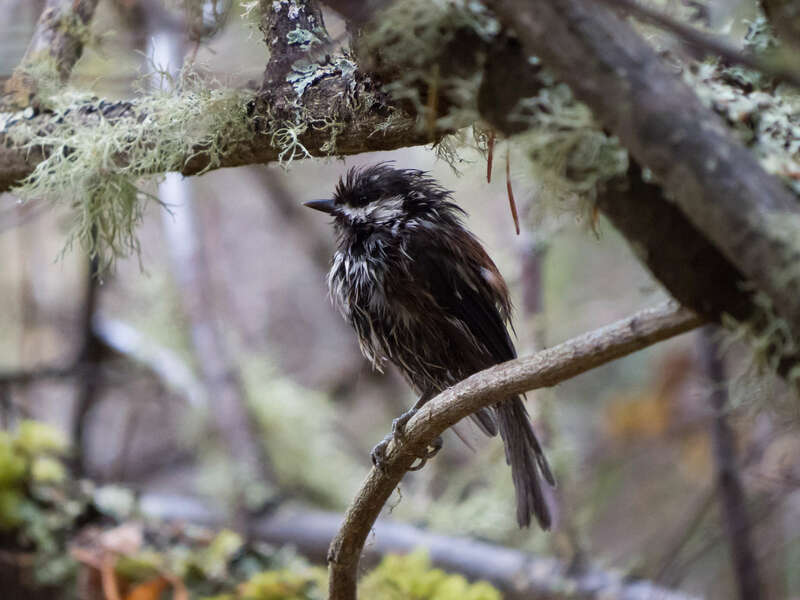 And that is when I met the wettest chickadee ever. So much so that I laughed out loud on the trail and a little girl came up to ask what I was looking at. 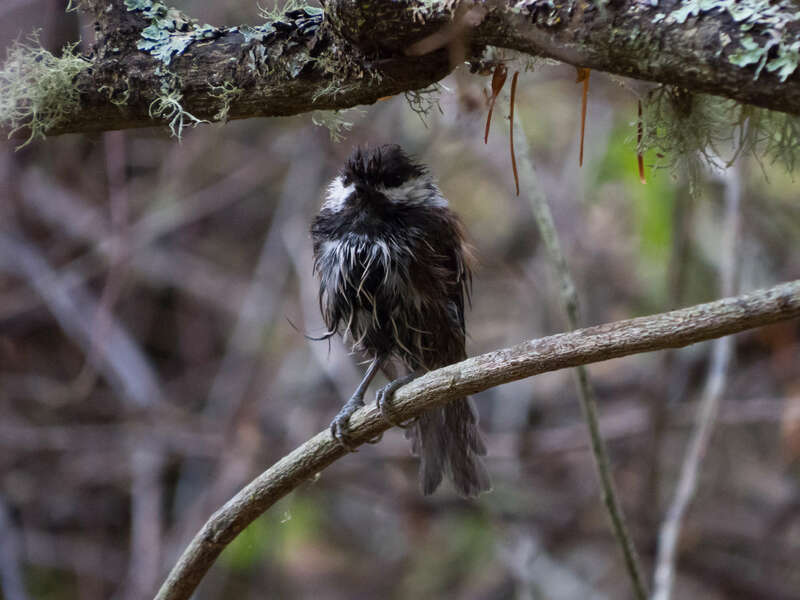 I pointed out the chickadee and asked, “Do you see him?” She laughed and said, “Yes, or her.” Good point. 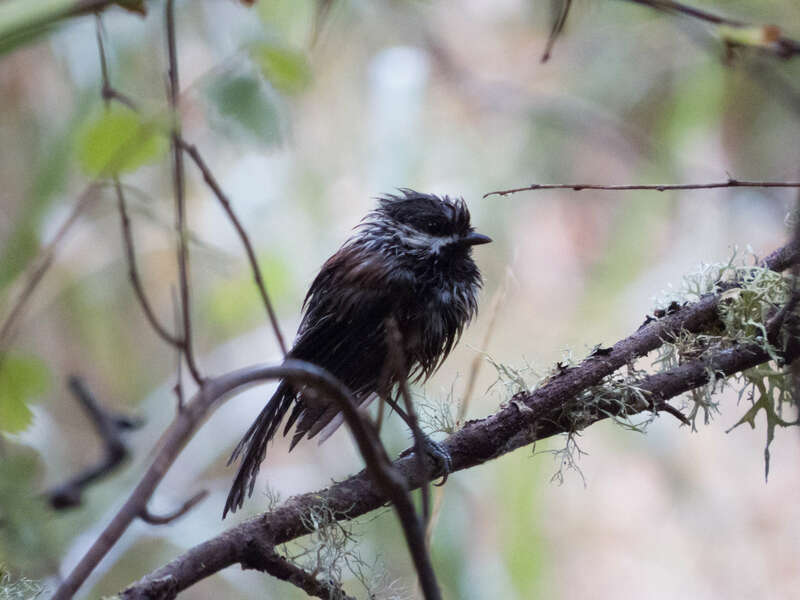 Also in the flock were Golden-crowned and Ruby-crowned Kinglets, an Orange-crowned and Yellow Warbler, Bewick’s Wren, and Brown Creeper. None of which I got great photos of. 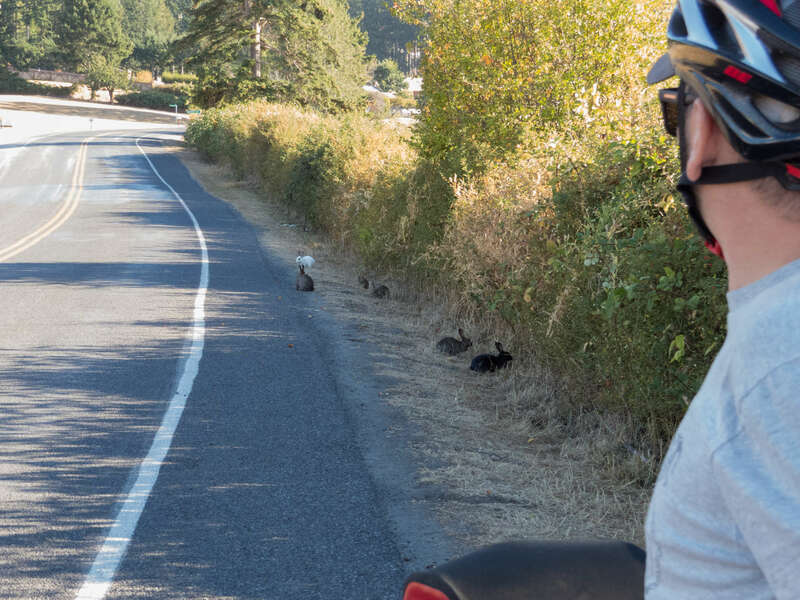 So here’s a picture of bunnies by the bike lane. 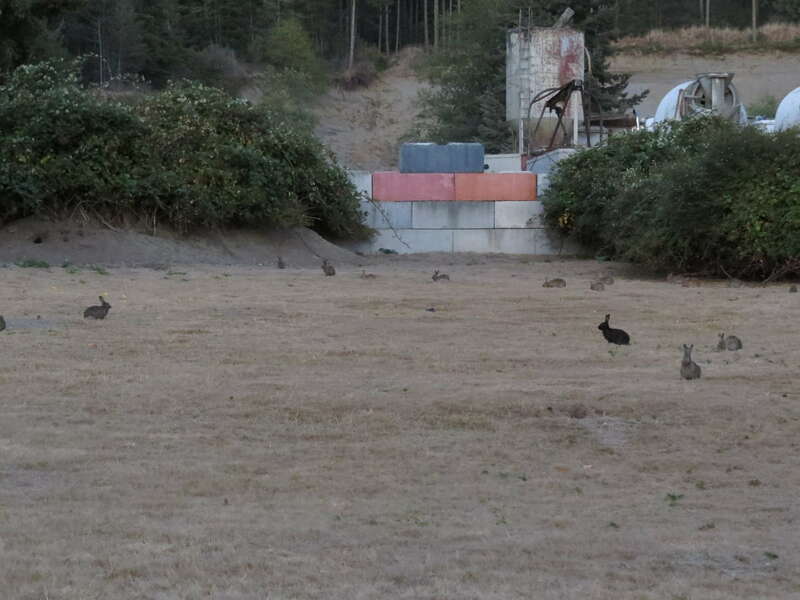 So many rabbits on Lopez Island. I wonder if we’ll ever learn. Here’s Rabbit Tales, an interesting read on the history of rabbits on San Juan Island. 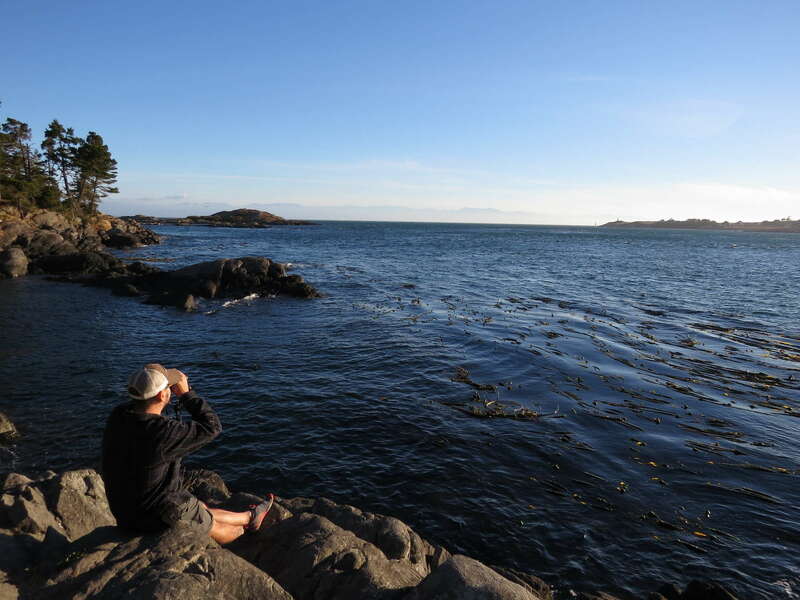 Tomas and I made it to Shark Reef Sanctuary, a short hike along the coast, hoping for a whale or good pelagic bird sighting, but there were only harbor seals, an angry bee, and a nice view of our next island destination. Leaving Lopez the next day, I stopped at several ponds and waterways on the way and found Green-winged Teal, Belted Kingfisher, Northern Pintail, Yellow-rumped Warbler, American Goldfinch, Lincoln’s, Song, and Golden-crowned Sparrow, Common Yellowthroat, and a Black-headed Grosbeak which was the most unexpected sighting. Lopez was a great start to our island adventure! 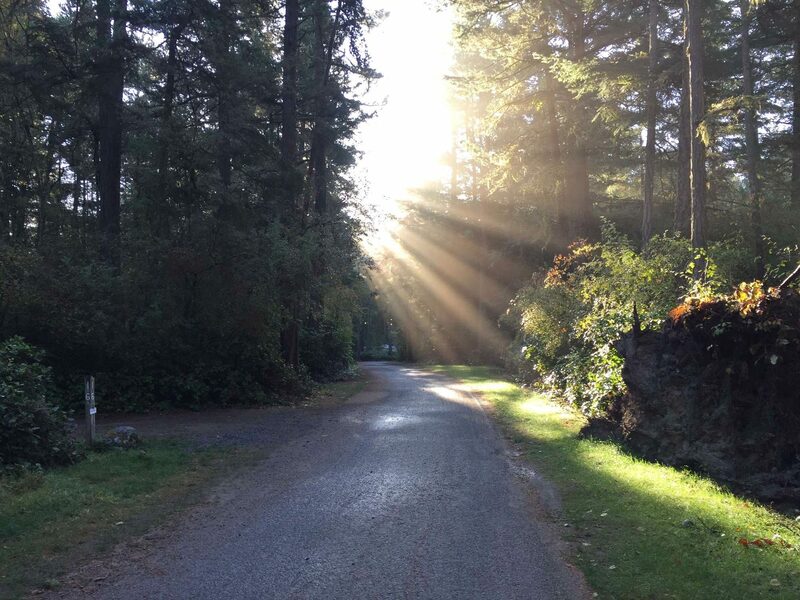 I couldn’t wait to explore San Juan Island next.